The Screaming Skull and Dragon Assisted Opening Pocket Knife is rich with details from the ridged vertebrae on the blade’s spine to the notched metallic red liners. It has a 3 1/2” black stainless steel blade with red accents and weight-reducing thru-holes. A flipper lets you quickly deploy the sharp blade with the assisted opening mechanism and the pocket knife has a linerlock. 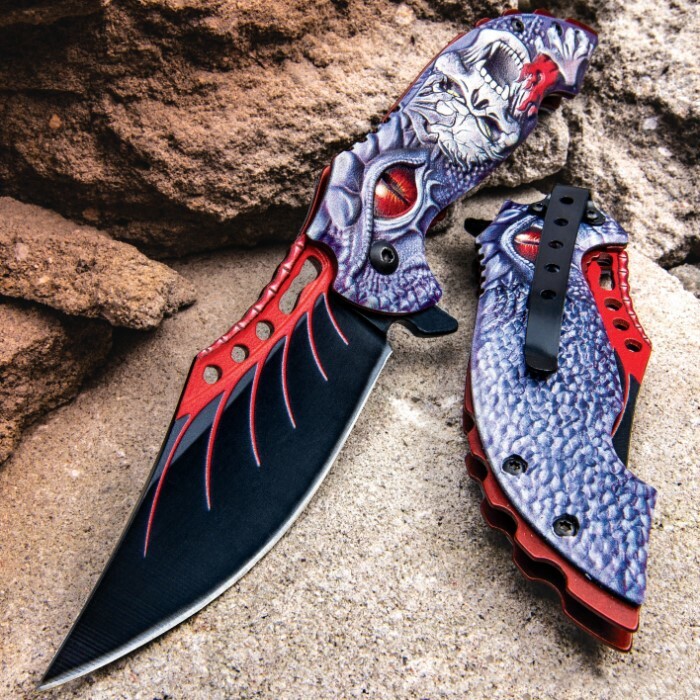 The aluminum handle scales have been 3D sculpted with a skull and dragon design in purple with red accents. The eye-catching pocket knife is 4 1/2”, when closed, and it has a black stainless steel pocket clip for ease of carry.